With point and shoot in hand these are what I captured the rest of the night. Maybe it’s not so much that these photos are blurry but I’m disappointed that I could not capture the essence of the dance. That has nothing to do with the camera it only has to do with me. Does that have to be inborn? Or maybe I have to do more reading and shooting. I’m sure I have to do more what ever it is. 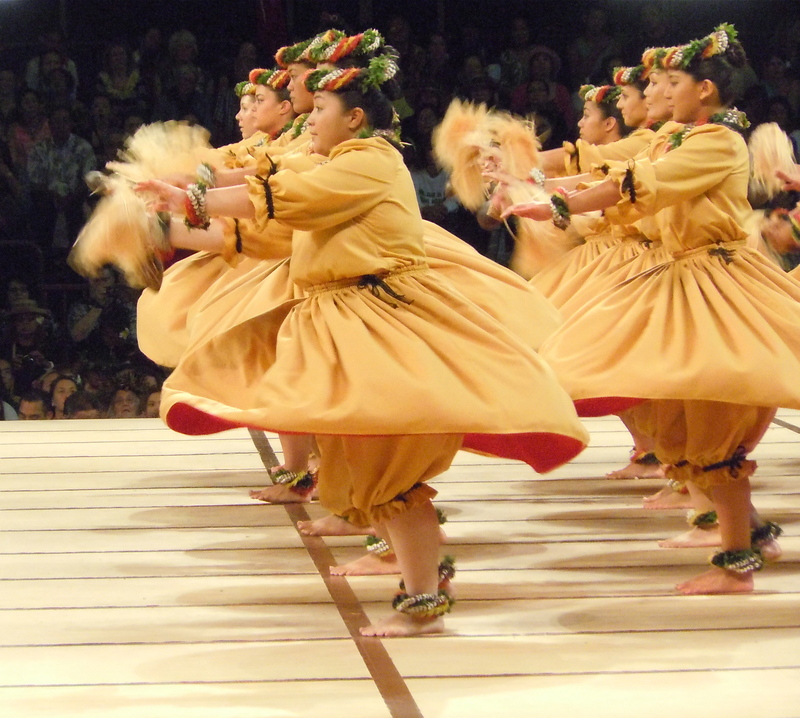 As the dancers enter the stage part of how they approach is judged also. They will enter like the girls on the right then dance on to the stage in stages. 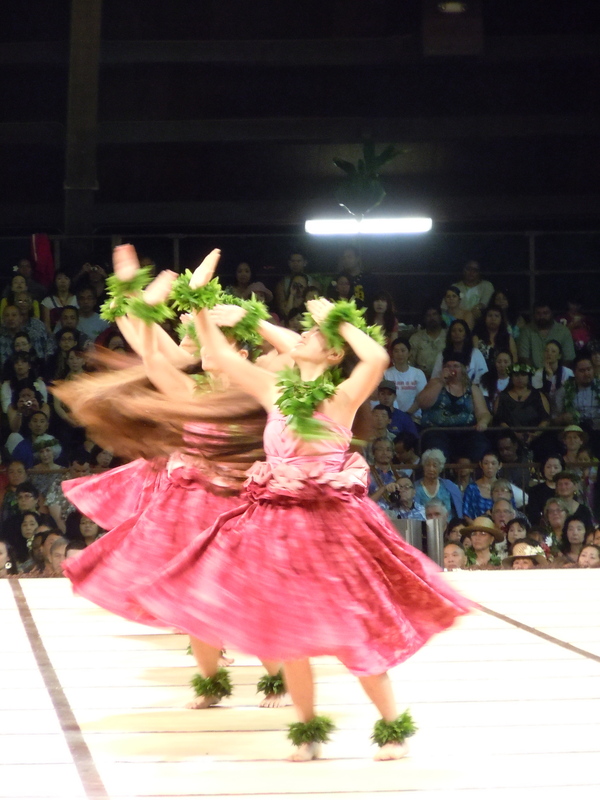 I love to capture the hair and skirts as they swish in the same movement. Many think of the ancient Hawaiian women with their log hair down their back but their was a time during Capt. Cooks visit that the women actually cut their hair very short and bleached it in the front. How they bleached it I don’t know but it was quite stunning. We have drawings of the women at the Bishop Museum. Withe such a large group it is very hard to manage a dance and have it totally synchronized. 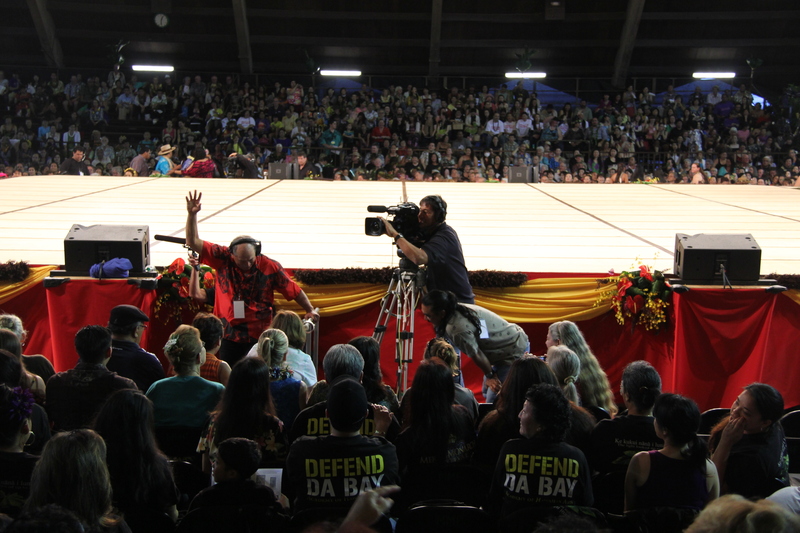 When the men enter the stage the house gets uproarious and hoots and clapping, whistling and energy rises. Even though the patterns on the costumes may seem too modern there are actual Kapa clothing in our displays at the muse with this pattern. 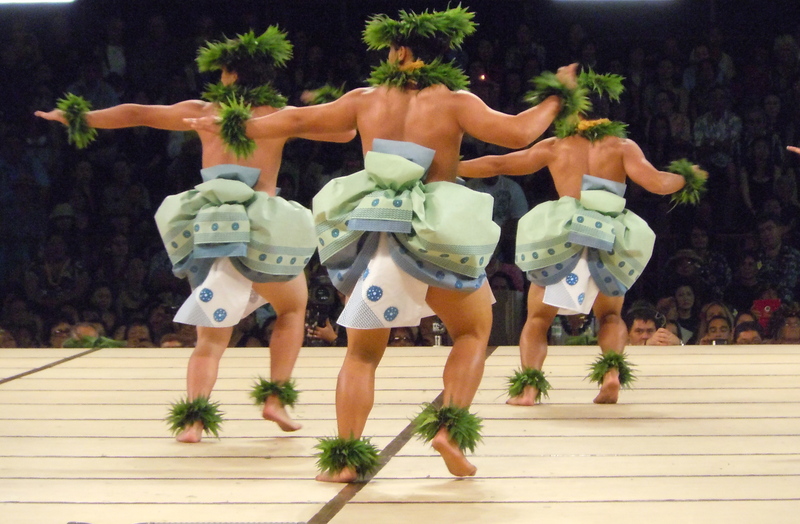 There are also sketches of ancient Hawaiian dancers with this exact style being worn as the men dance. Kapa clothing was quite colorful contrary to what many people thing of. This move is not as easy as it looks and many hours goes into practicing this in order to be able to carry it out flawlessly. 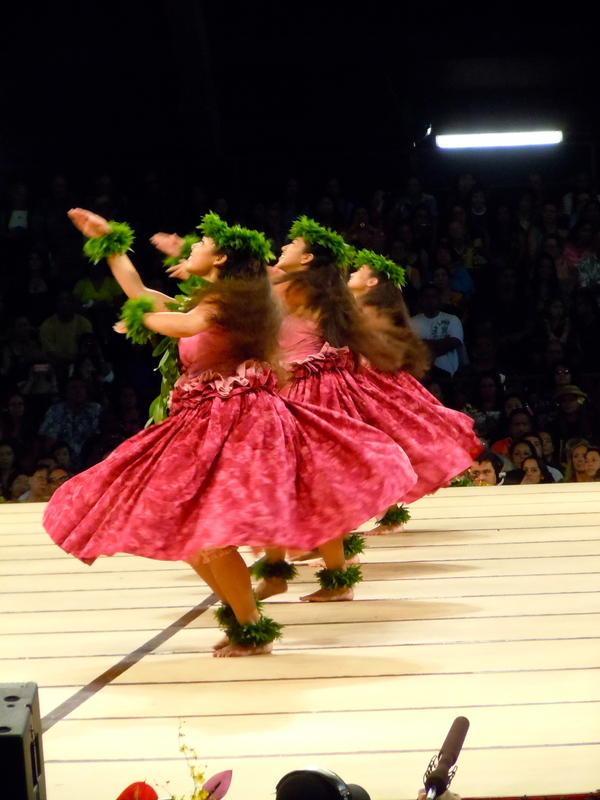 All the greenery you see here is made by the dancers. I know that some halaus even go into the mountains to pick all of the vegetation that they wear. 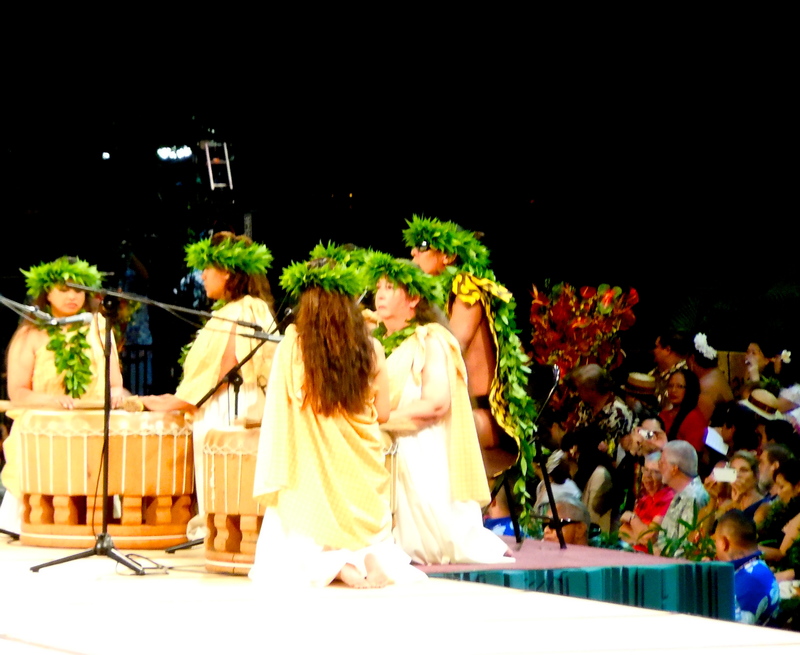 Here the kumu, I believe she is the gray haired lady, and her group do the chanting and accompaniment for the men. Again I am not sure exactly what period this is because it definitely has the influence of the missionaries which does not seem kahiko to me. But then again it is the 50th anniversary so I am not sure what they were trying to portray here as kahiko. This reminds me of the Sumo outfits I’ve seen. Even the hair. I so wish I had the program to be able to tell what this represented. 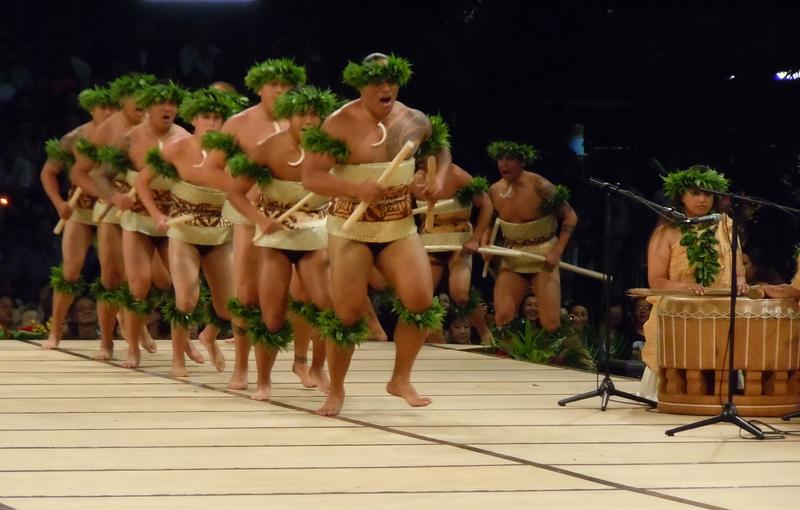 This is my grandson’s kumu and the above photo shows her men dancing. The costumes can be very elaborate and costly. I’ve heard that you might have to pay around 1500 in cost just to be in one of these competitions. This particular competition is non-profit. I love the ankle and hair pieces along with the costuming. 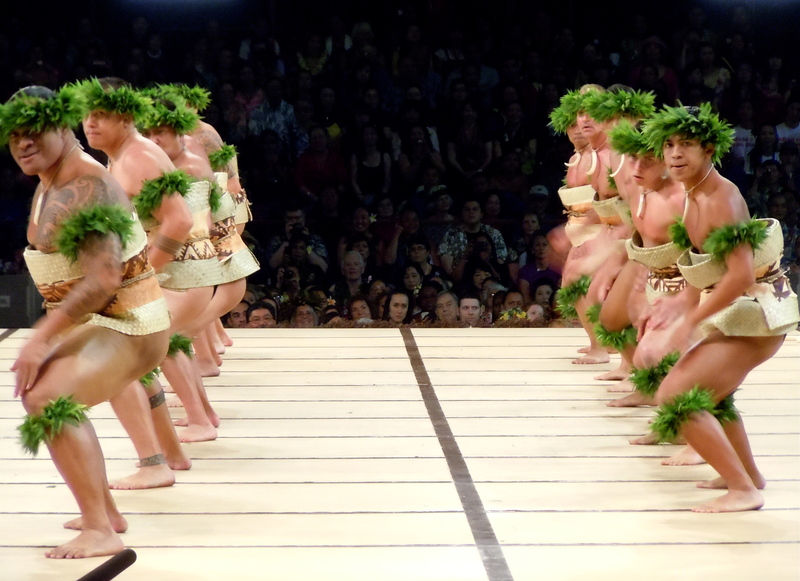 This costuming is more what I think of the Kahiko style and of course the men always bring the house down when they dance. It is really high energy. 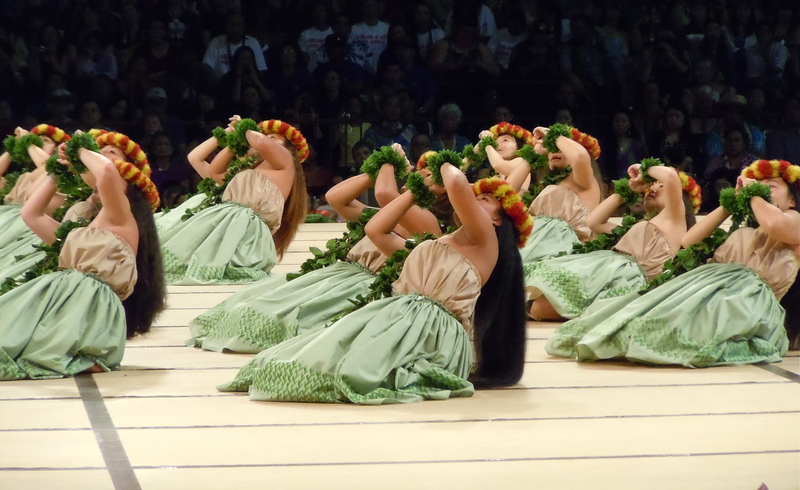 Again they are performing a difficult move but with their long hair hanging down in back I think it is so beautiful. The ti leaf draped over the skirts just makes the whole look. 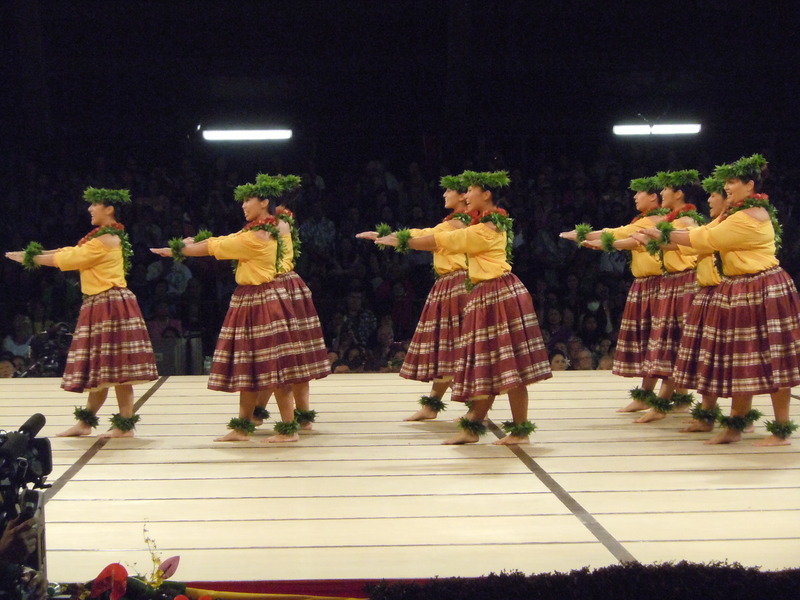 This halau is from Oakland California. 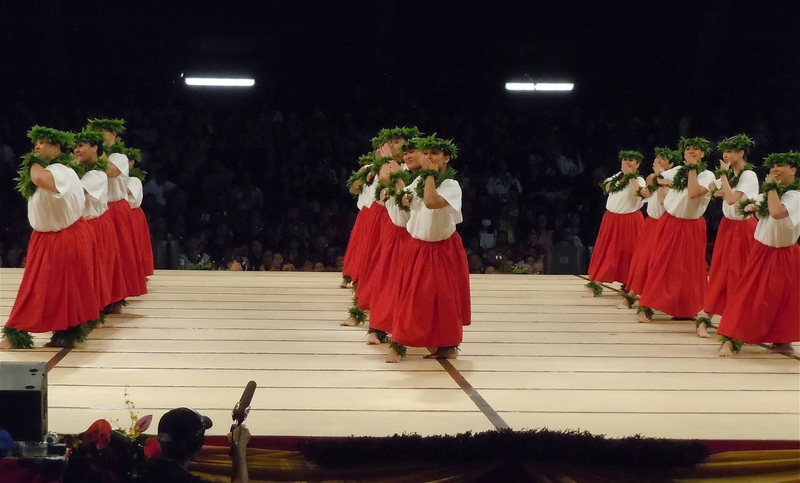 Their kumu in not quite traditional but oh these guys were great. I would love to see them again. People went wild when they danced. Unfortunately they didn’t eve place. 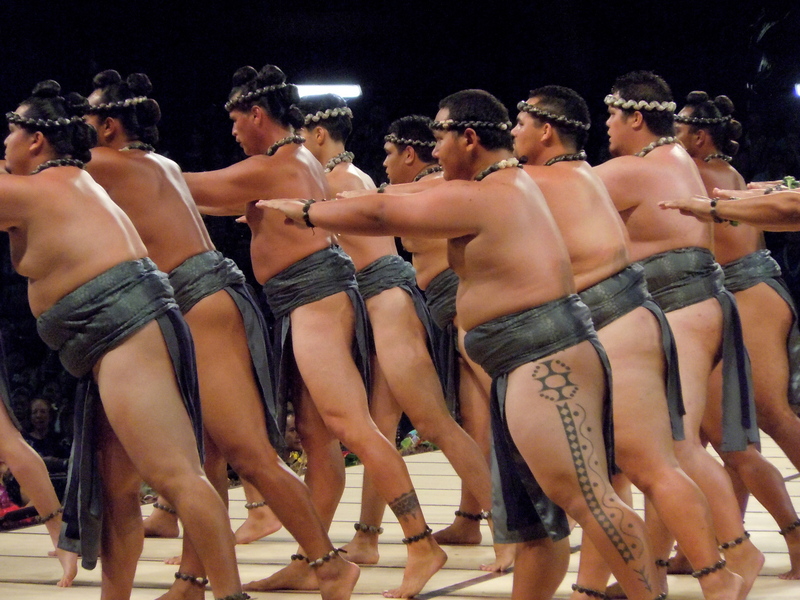 The kumu for the above men is in sunglasses. Perhaps that is part of what takes marks away from their performance. I don’t know as it certainly wouldn’t be considered traditional. 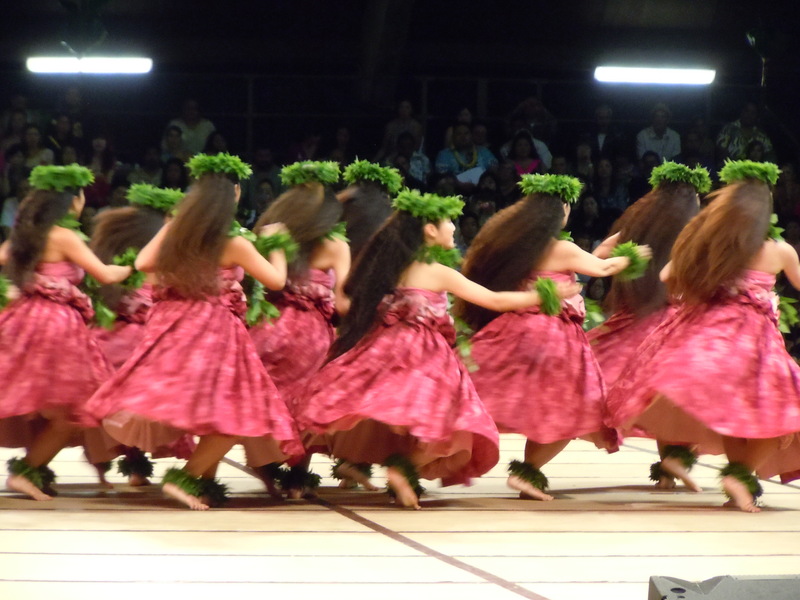 But as I think back to all of the Hula I have seen through the years all of it has changed what was traditional then is rarely even seen today. These were the drums he used. I don’t know what they are made from. The drums we have at the museum are made from coconut and the top is stretched with sharkskin. I had taken over 200 that night and these were the only ones that turned out half way decent. On part 4 I will tour the island a little bit visiting the birthplace of my kids grandparents. 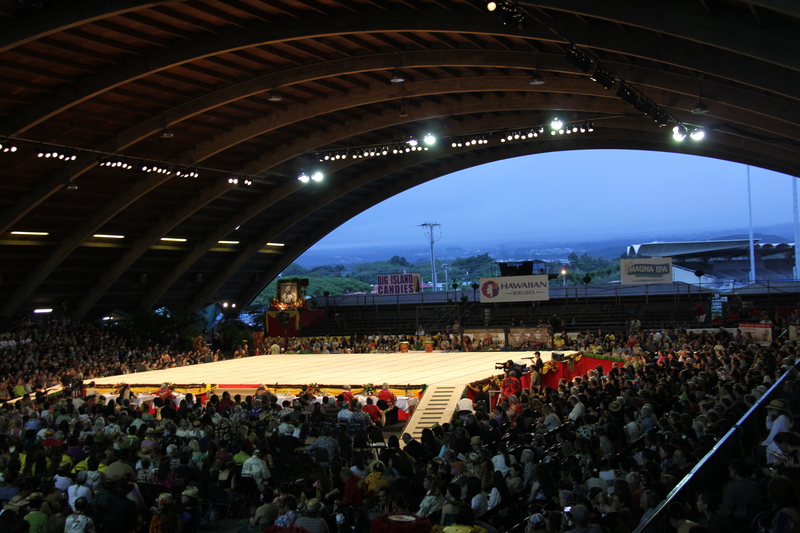 The Merrie Monarch Hula Festival, a fascination destination for me, was celebrating its 50th year of competition. I tried to envision the old gym it was held in. Open sides I was told and very cold in the evening. In my mind’s eye I could see the portable benches going up the sides of the building, the smell of old wood and everyone sitting where ever they could in a first come first serve seating. And now here I was and I was pleasantly surprised. My son dropped me off in the front while he drove around looking for parking. Parking was at a premium to say the least. I stood in the front lot looking at all the peopled dressed in various stages of casual to beautiful full dressed Polynesian. 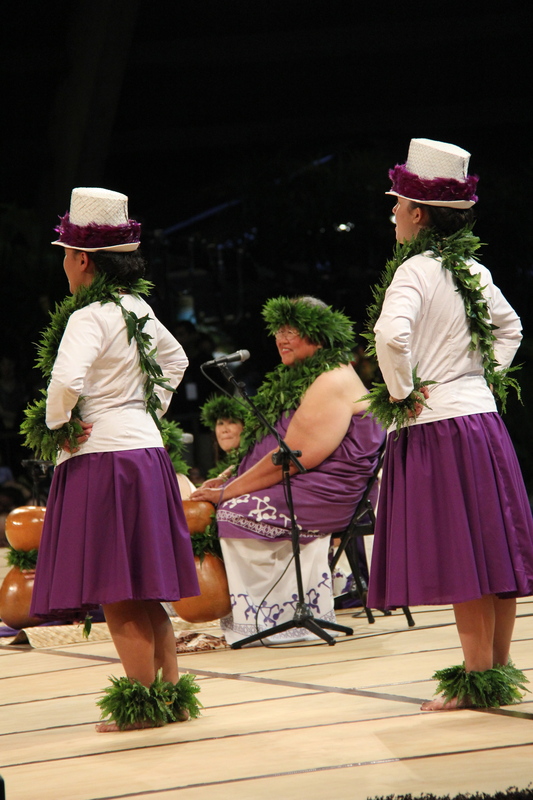 Muʻu muʻu and hand-made lau hala hats with huge flowers pinned in the hair. From a distance I saw this man dressed in Hawaiian costume talking on a cell phone. I thought he was just a sort of welcoming committee. 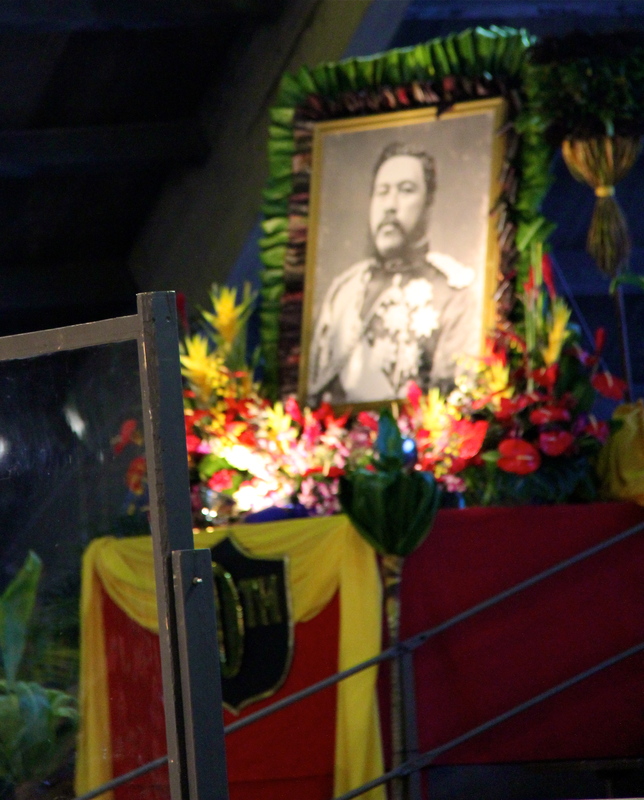 But later inside he was to proceed Princess Kawananakoa, A distant decedent of King Kalakaua, as she was ceremoniously guided to her seat. Now if there are any of you out there who would know what the proper name for his position is I would be very happy if you could fill me in. This is what I saw as I entered what I had imagined to be a little basketball gym. You are looking at about three-fourths of the audience. King Kalakaua. 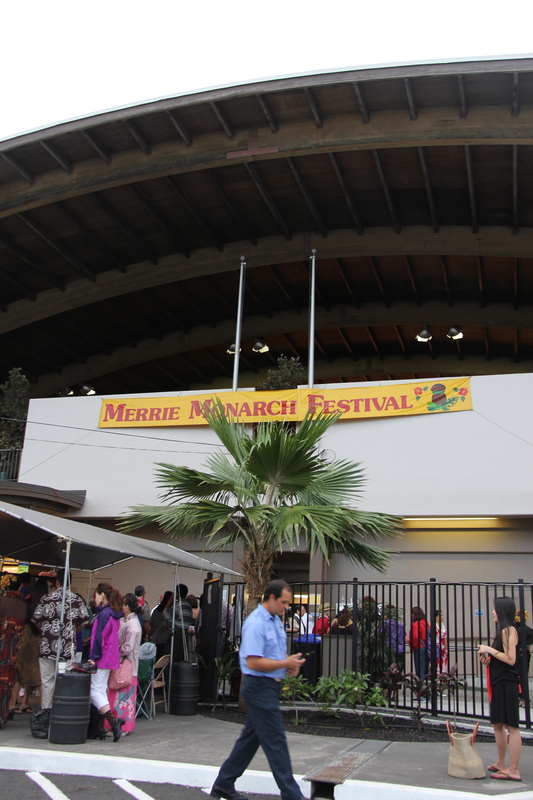 He was known as the Merrie Monarch. 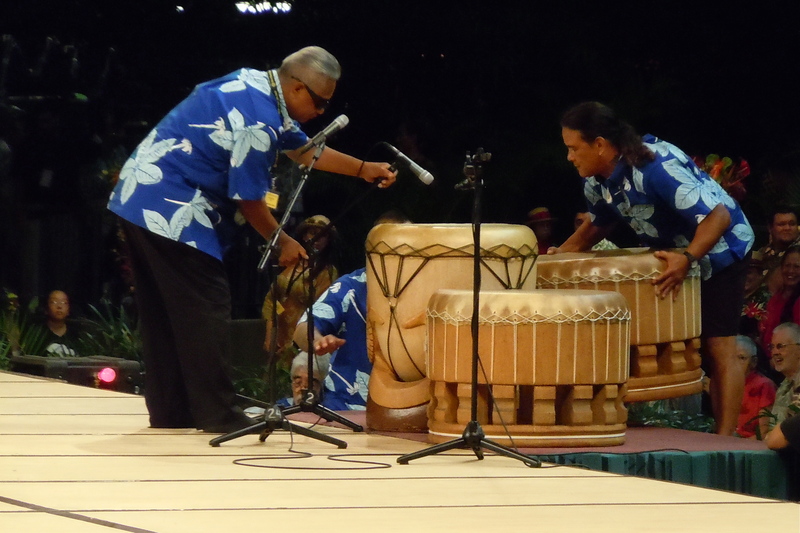 He was responsible for bringing back the Hula. During his reign he defied the missionaries who had banned the dancing and at all his events he would have halaus perform. Thus the name of the competition. 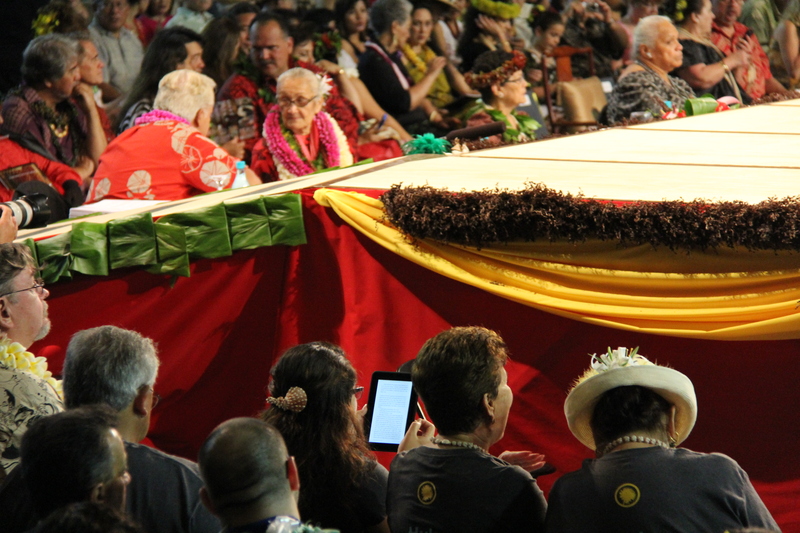 With all her leis, she is one of the judges. 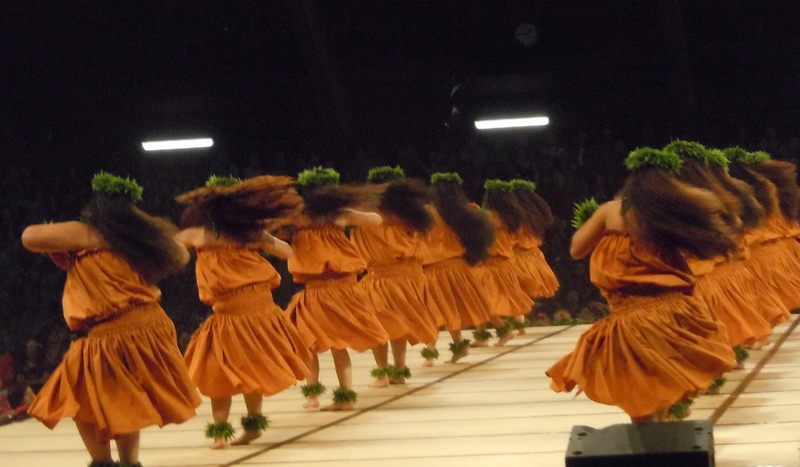 This is the Kahiko competition. 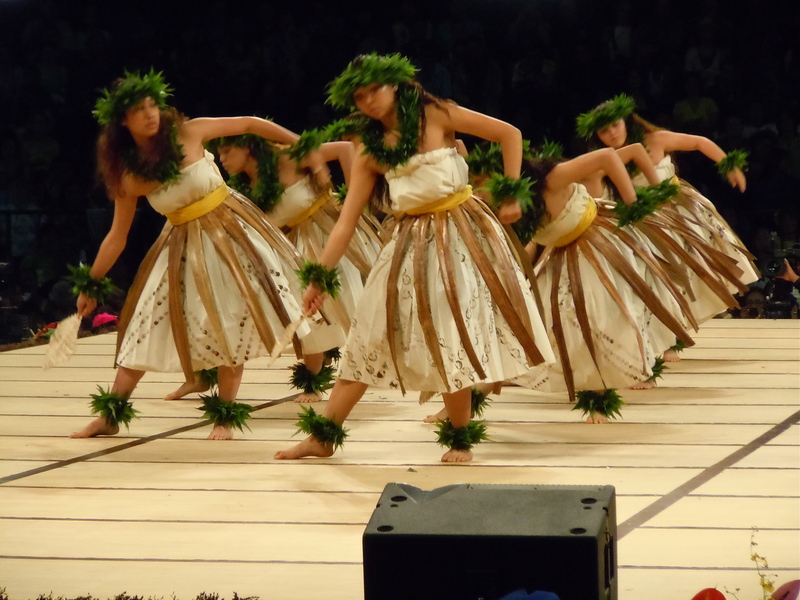 Kahiko is the ancient style of hula. It is danced to the sound of drums and chanting. There is no music or singing. My camera was heavy as I carried it that night but I was so excited to be able to at last have a zoom lens and capabilities to get shots without blur. Unfortunately I also became a critic and kept waiting for the right shot instead of just firing away.The only got this shot of these men. 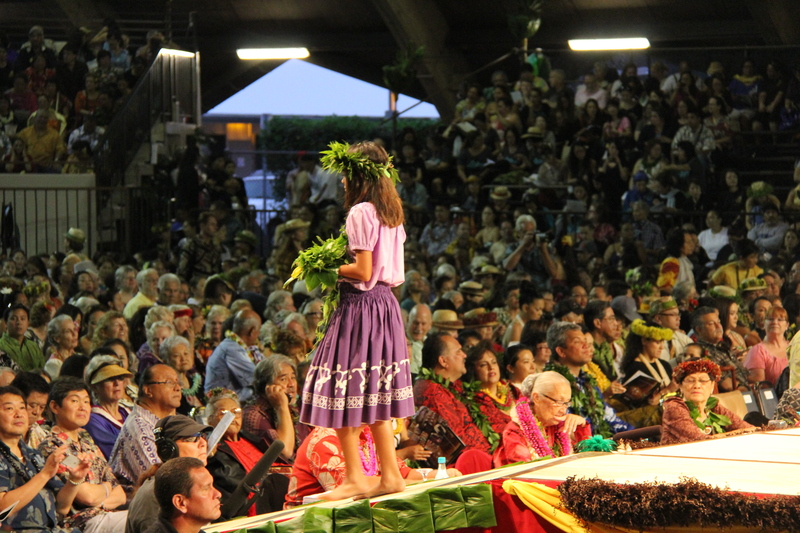 This young girl proceeded her halau with what is called a hoʻokupu or gift or offering. I’m not sure who or where she took it to as I could not see once she got off the stage. Here the dancers are getting ready to enter on to the stage. 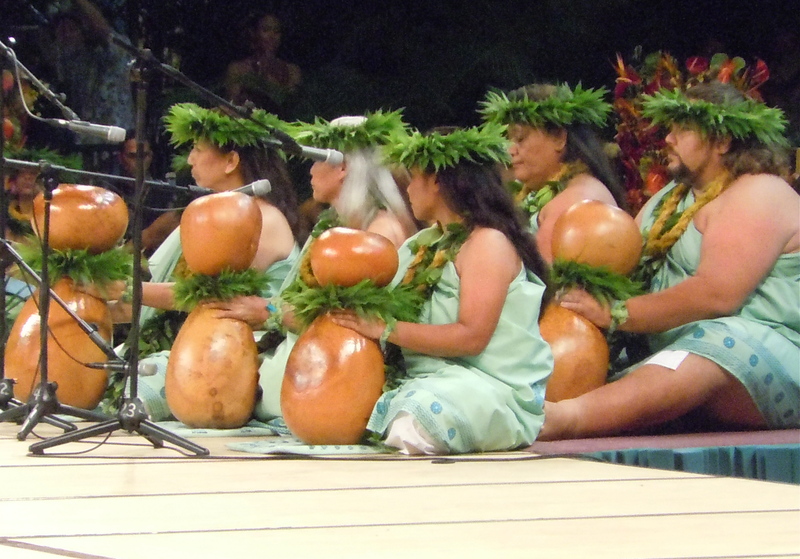 The seated woman is their kumu or teacher. She will do the chanting and the playing of the ipu or gourd. 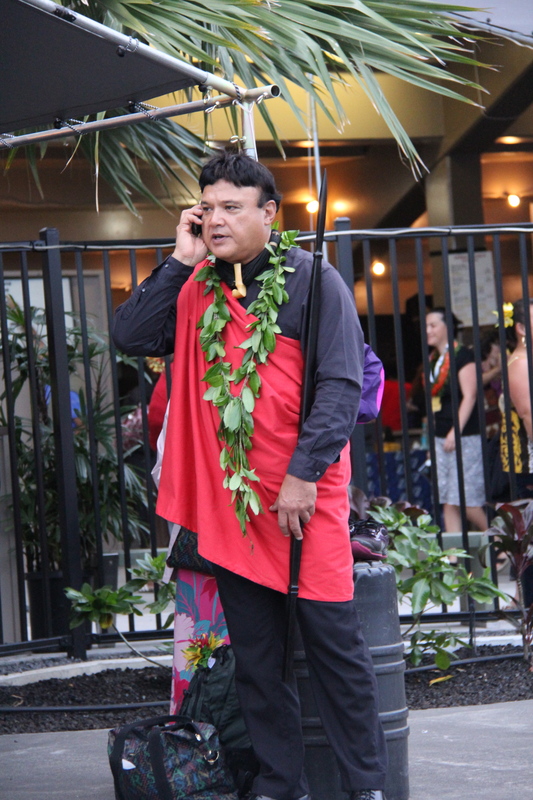 This particular style of dressing was not what I thought was indicative of the kahiko. Since we were unable to get a program, as they were all sold out, I was not sure what they were performing. Even though I had read as much news on this particular competition I never read that the kahiko might be from a later period of time. 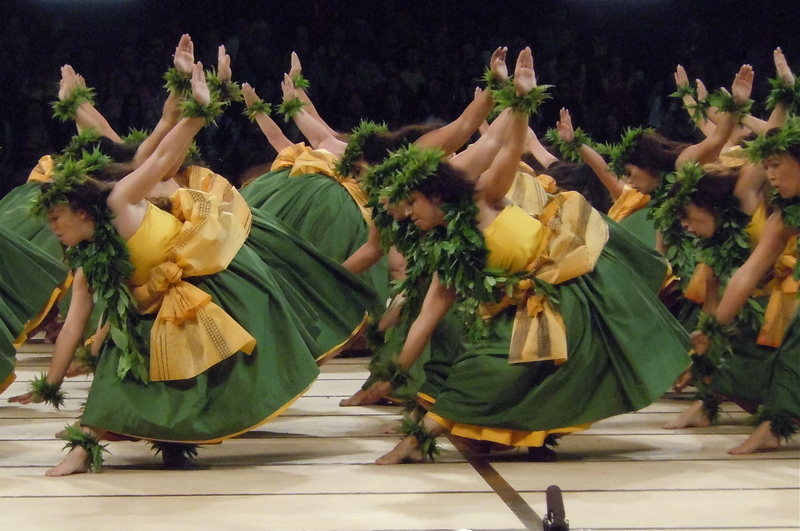 When I think of Kahiko I think of pre-contact or Captain Cook’s time when drawings and written accounts were first made available of Hawaiian dancing. I know they never dressed like this. What? Why not I asked as I looked around at all the cameras going off. He told me I could use my camera phone or point and shoot. And what was I going to do with my cell phone? I looked at my son and all the people in front of me who had turned around and seemed to be as perplexed as me. There was a time when this competition had almost failed because it just was not catching on. And now that it is world renown and they are selling shirts, books, and what have you they don’t want you to take a good photo as they (I think) are afraid you might sell it and make some money? Of course this may not be true but this is exactly what I felt. So my son turned to me with my old Nikon point and shoot and said to me. “Good thing I brought it yeah?” He was laughing but he was mad. I was not laughing and wanted to leave. At last I calmed myself down and put my heavy, no use to me camera away and turned on the point and shoot. So in part three I will continue with blurry photos and not as close up shots as I would like. Seems like old times doesn’t it? I estimate that it has been about five years since I left Oahu. The thought of going through all the hoops, ex-rays and security has left me empty with the thought of going anywhere again. Air travel certainly has changed. 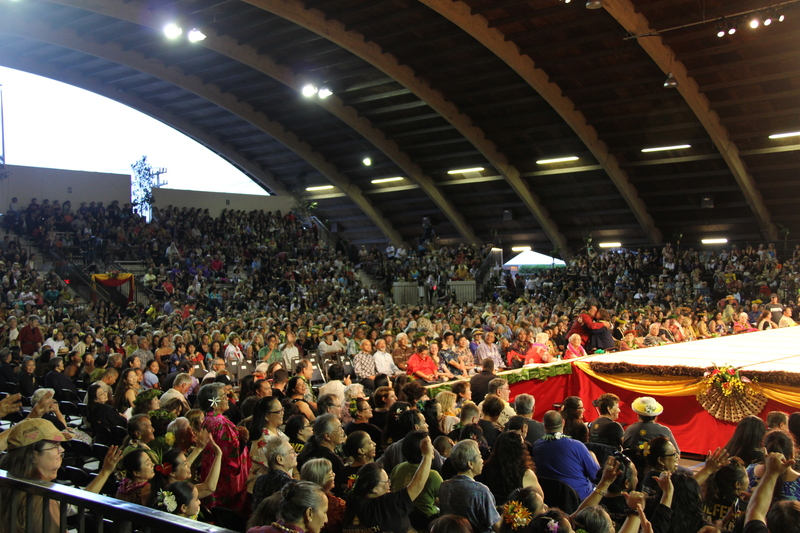 It was my son’s invitation to join him and his girlfriend to see the Merrie Monarch Festival. 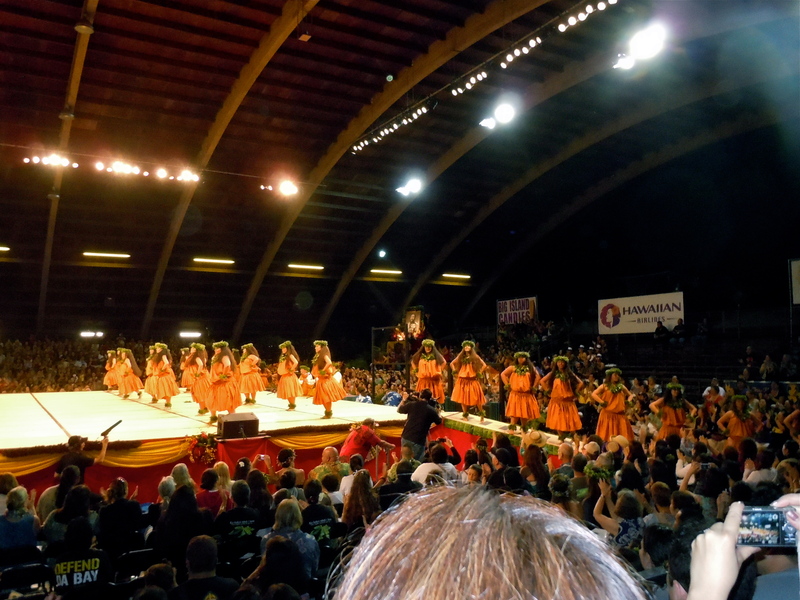 The Hula competition of Hula competitions was the only thing that would make me drop my knitting needles and head for the airport. Getting a flight reservation was almost a miss. I booked in November and just barely got a seat into Hilo, Hawaii for April. 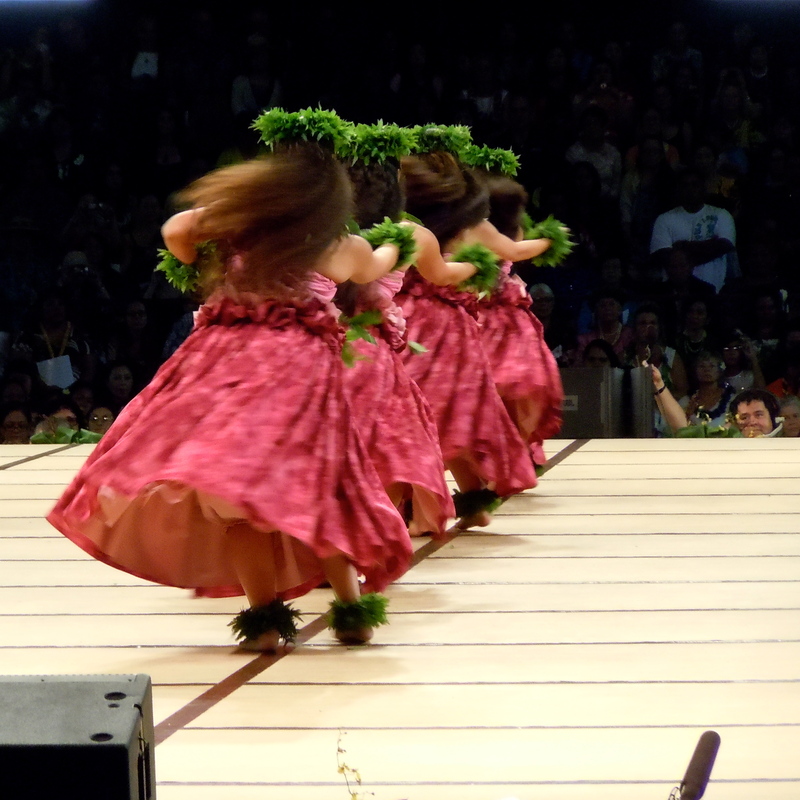 The only reason we even had tickets for the competition was because Maria, my son Josephs girlfriend, danced for the halau that was competing at the Monarch. There were 9,000 requests for 2,500 seats. So you can see why it was hard to get a flight and hotel. Indeed I could not pass this up. 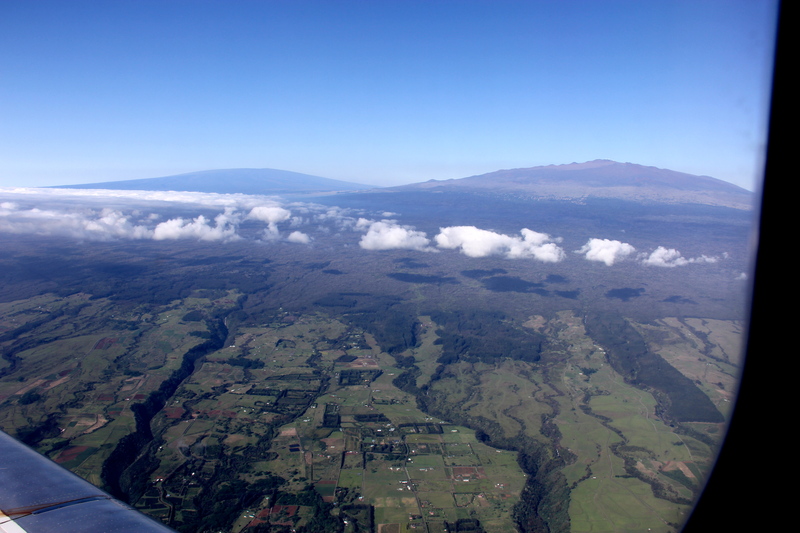 In my seat flying over to the Merrie Monarch you can see Mauna Kea where all the world come to build their telescopes. In the winter that mountain is covered with snow. In the back is the infamous Mauna Loa, the volcano that is still very much alive unlike Mauna Kea which is considered a dormant volcano. Even though many of Hawaii’s volcano’s are called dormant they can never be called dead. A volcano can become active at any point no matter how long it has been since it have erupted. Since I don’t know much of anything about the geology of volcanoes, I can only say, I think these are vents or cinder cones from the volcanoes. In 1881 The Hawaiian Princess, Ruth, was sent for by the citizens of Hilo as the volcano, Mauna Loa, was erupting and getting deadly close to the little town. The Christian missionaries of that time were saying all their prayers in hopes that god would intercede and stop the flow. But the people felt that the Princess was the only one who could help. 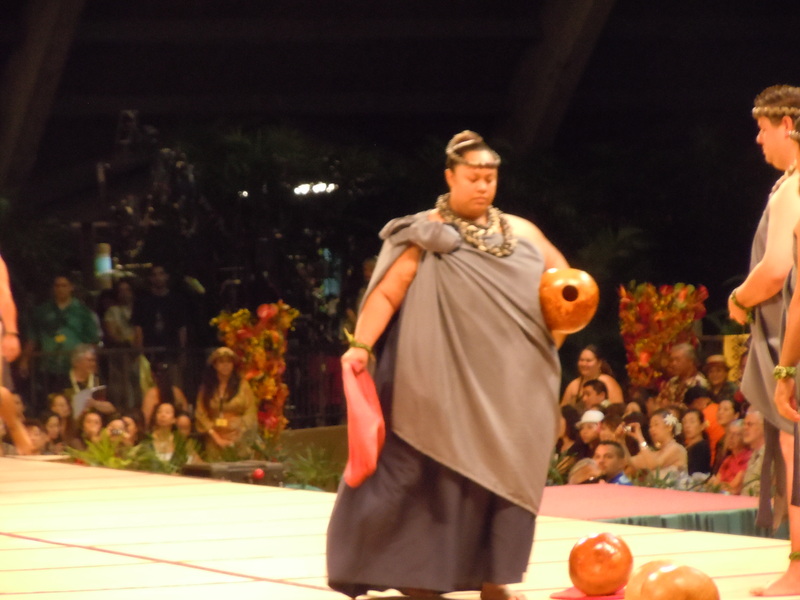 From the island of Oahu Princess Ruth, who was said to be around 400 pounds, was loaded onto a barge with a cattle sling, (yes, just as depicted in the movie “Hawaii.”) and sailed to the Big Island of Hawaii. 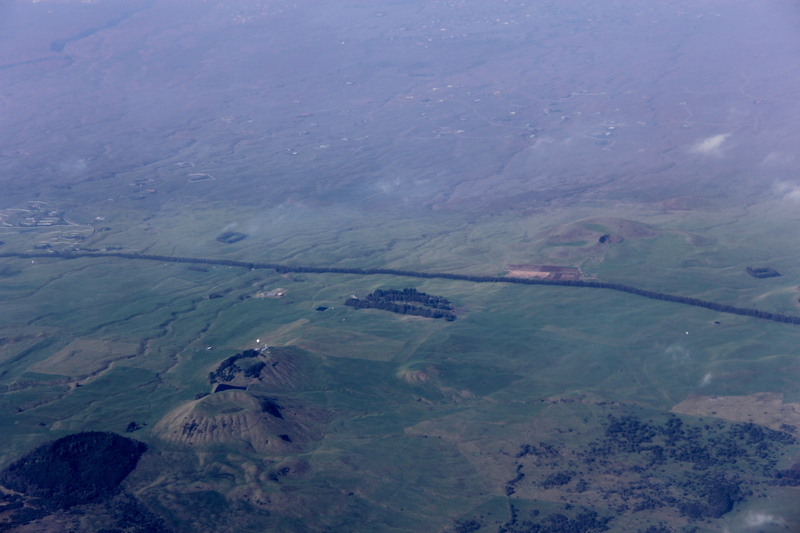 There she was greeted by her people and a large carriage and a horse to pull her up to the lava flow. The horse was unable to do the job so prisoners from the Hilo prison were selected to pull her up the hills. It was a slow and arduous trip for the men pulling her but she was finely brought to the flow where she was set up for the night. She made offerings and said prayers to the goddess Pele. She then laid down for the night right at the head of the flow. The next morning the flow had stopped. There is much to this story and very interesting but I shall leave it for another time. The Big Island is also known for its large Koa Trees. Elsewhere these trees are known as Acacia. 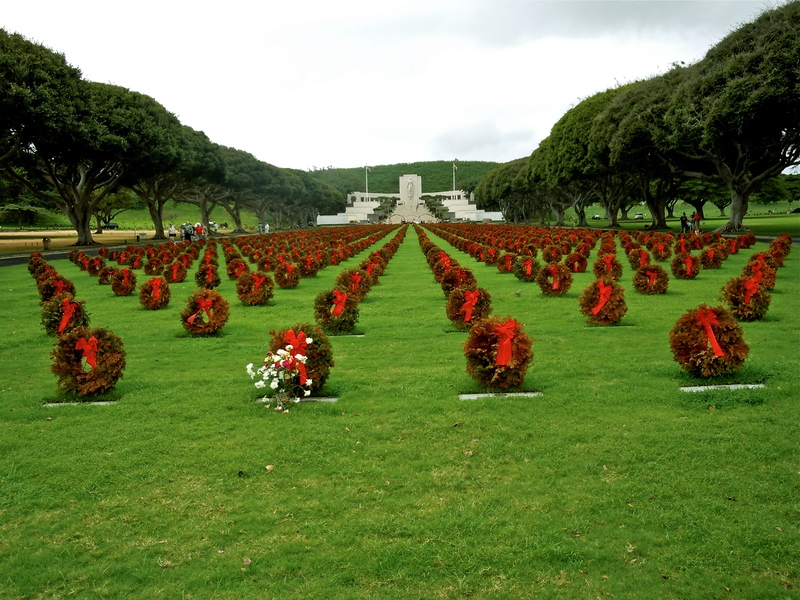 Koa trees grow on all the islands but not as big as they grow on Hawaii. I have read a theory that King Kamehameha, who lived on the big island, had an advantage when he went to war against all the other islands. 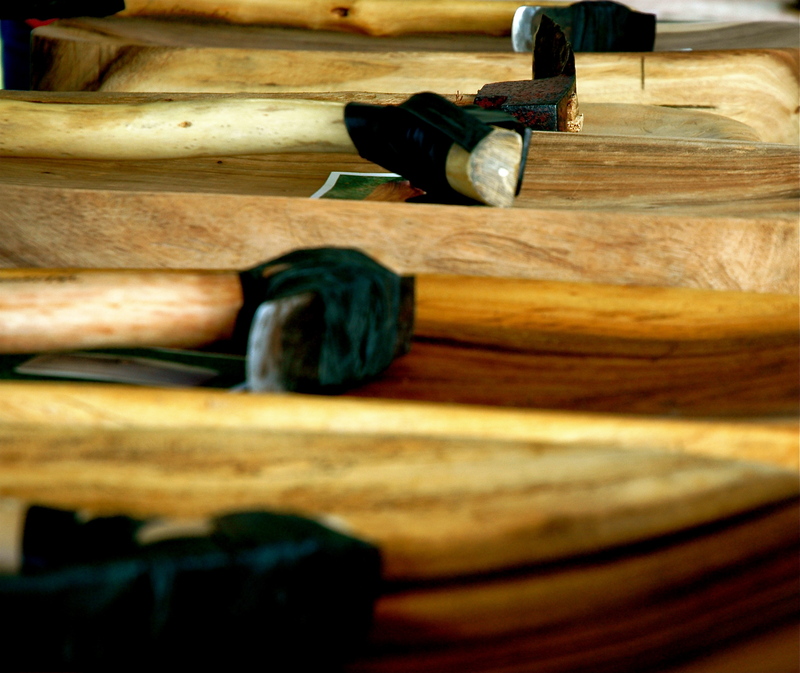 As he had such huge Koa trees he was able to build the largest canoes. They were able to carry many, many warriors and also they were able to take the weight of the cannons that Kamehameha took with him to fight. 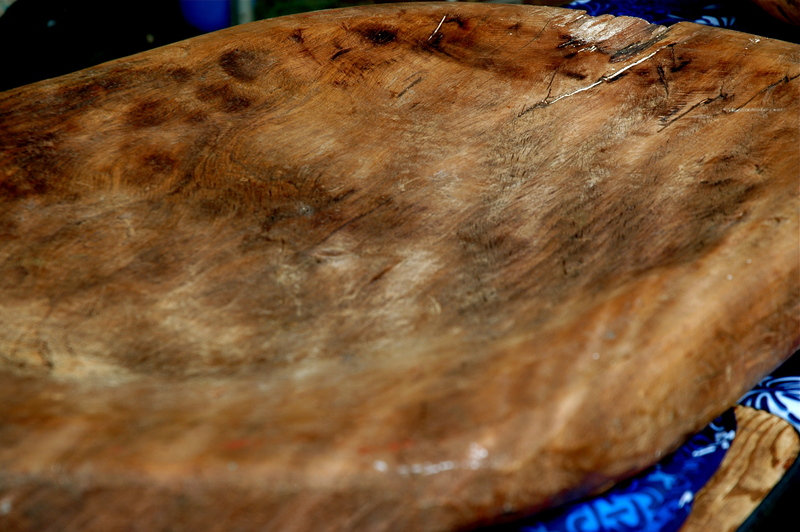 The above photo shows a piece of Koa in the process of being shaped into a container that is used to pound poi. Here are some of the finished bowls along with the handmade adze used to shape them. Koa which at one time was abundant has dwindled down to scarcity and now the prized wood when cut down is put into a lottery for bidding. 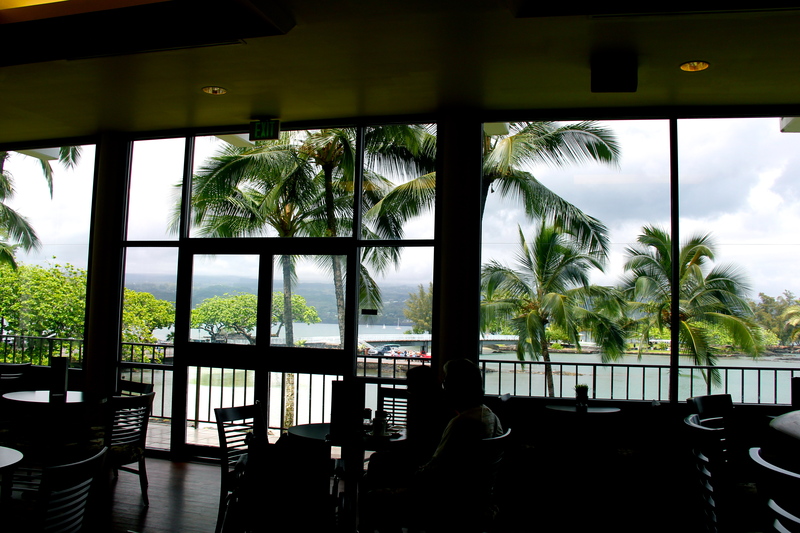 We had left Oahu at 4:30 and arrived in Hilo about an hour later. We then went to our hotel to drop everything off. I had been lugging my camera with me and my computer and was glad to be able to put everything down for a few minutes. Then we were off again. I with my DSLR and my son with his point and shoot that I had given him. First before anything though I wanted to take photos of the views from our hotel room as it was such a wonderful scene. 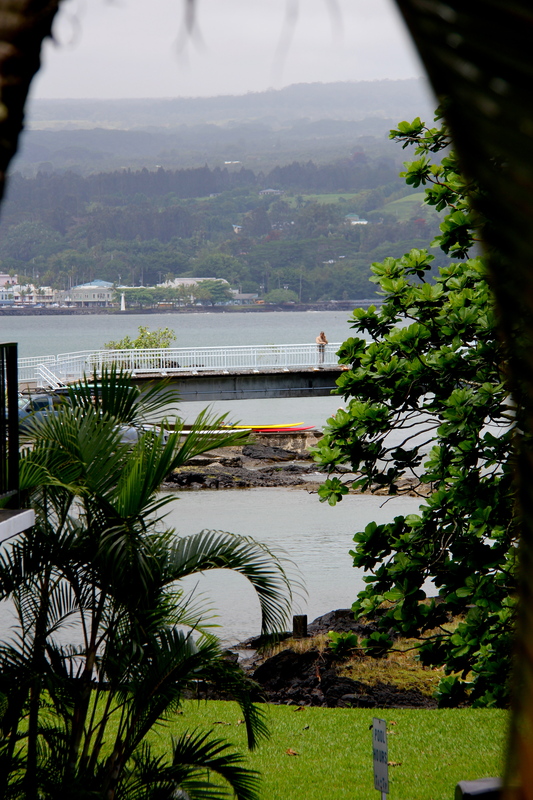 The view right out my window from the Hilo Bay Hotel. The island is unbelievably green. 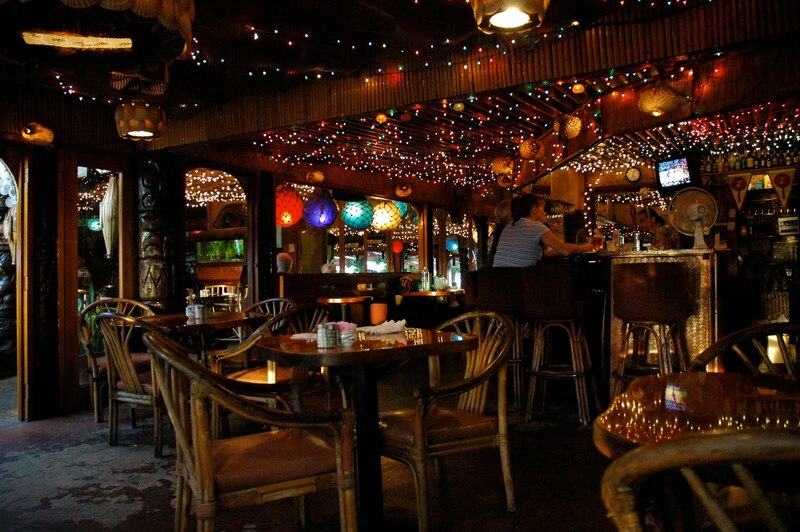 There is much more and still retains much of its ancient feel. You are not driving in mind-boggling traffic as you are on Oahu and there remains many of the old buildings from the early 1900’s. 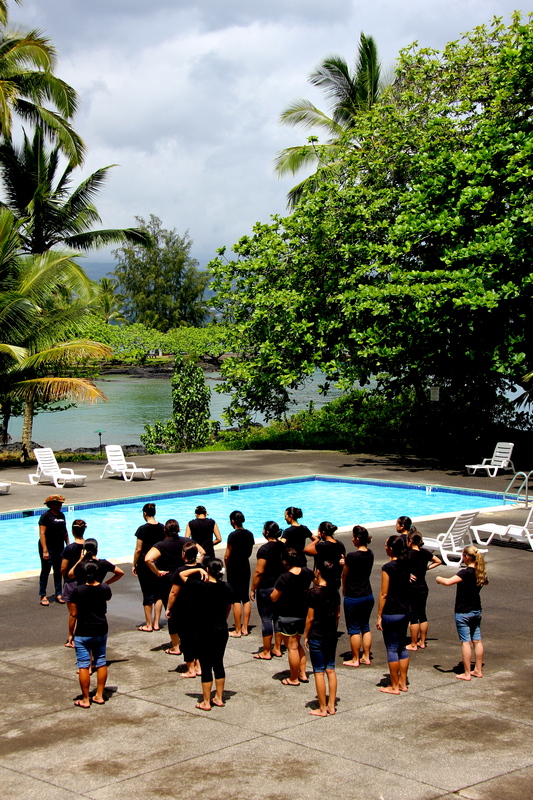 One of the halaus (hula troop) at our hotel was still practicing before their competition down at the pool. 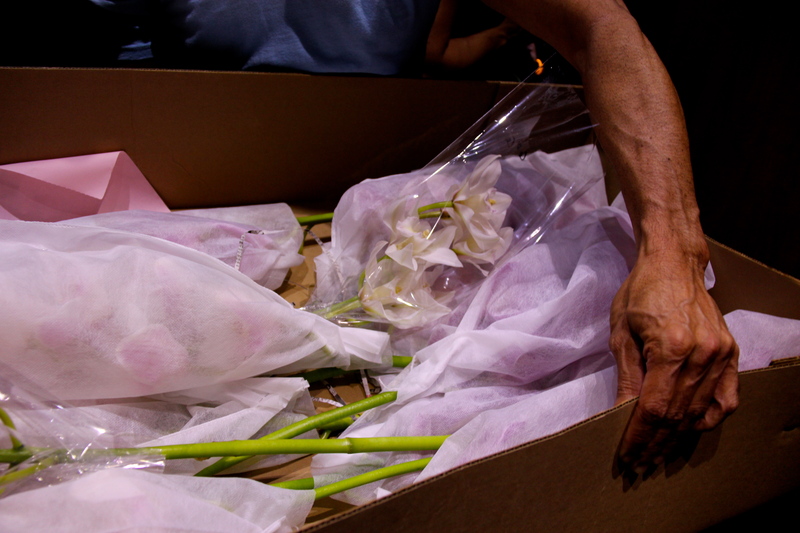 In the elevator this man was holding the orchids to be delivered to one of the halaus for their head dressing. I had taken my photos and running to catch up to my son and Maria we got into the car and we were off to the first of the two nights of competition. 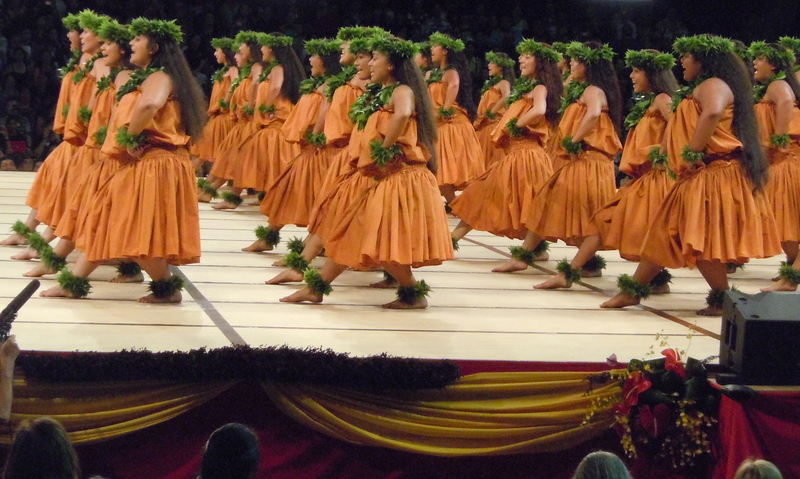 This first night will be the Kahiko (sorry I put auana first time around) . 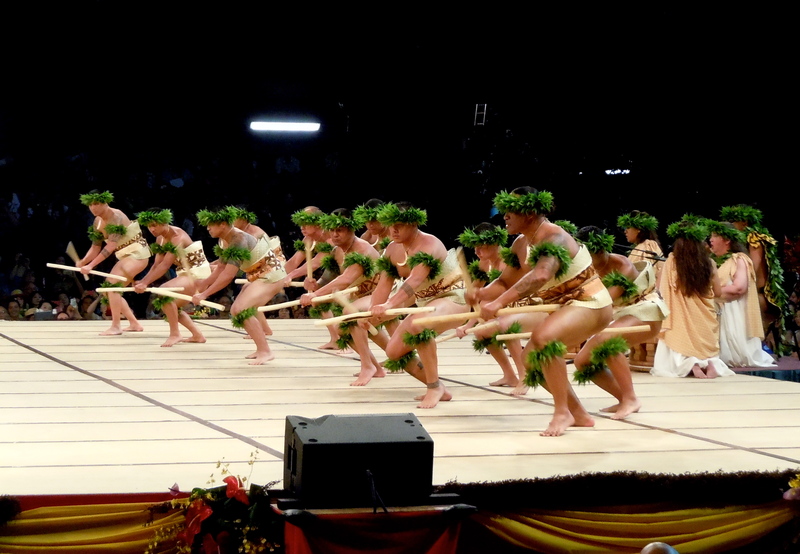 This is the traditional ancient hula. In Part two I will post the photos from this first night.